New York, NY — Afterlife with Archie, the acclaimed ongoing series written by Harvey award-winning writer Roberto Aguirre-Sacasa and Eisner award-winning artist Francesco Francavilla sold out at Diamond and will be immediately going back for a 2nd printing. The year’s most talked about comic book has received widespread media attention from national news, horror, and comic sites including VARIETY, DEADLINE, HOLLYWOOD REPORTER, ENTERTAINMENT WEEKLY, THE ASSOCIATED PRESS, USA TODAY, HUFFINGTON POST, FANGORIA MAGAZINE, IGN, COMIC BOOK RESOURCES, NEWSARAMA, BLEEDING COOL, BLOODY DISGUSTING and many more. 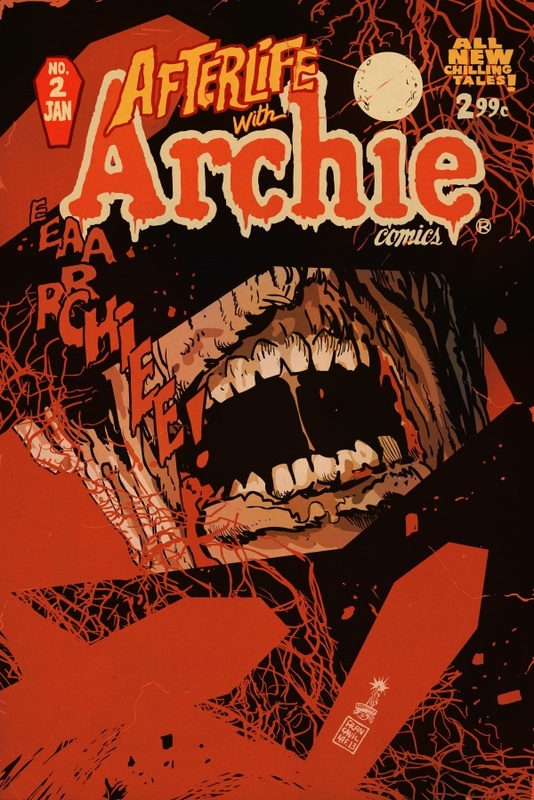 Series artist Francavilla has created a brand new cover for the 2nd printing of Afterlife With Archie #2, which will be made available 1/1/14. This is the second consecutive sold out issue for Archie’s first direct market only series ever. Stay tuned as the horror and suspense continue to build from issue to issue!